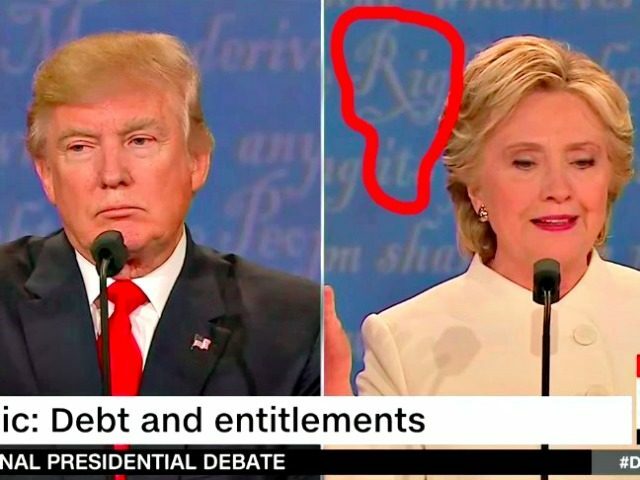 A Twitter user from GQ Magazine pointed out that the letters behind Democratic presidential nominee Hillary Clinton in Wednesday’s debate between Clinton and Republican presidential nominee Donald Trump spelled out “rig it,” The Hill reported. The letters behind Clinton and Trump were actually taken from the text of the Declaration of Independence, but the letters were obscured by Clinton’s head. Trump has repeatedly stated that he is in the midst of a “rigged” election, telling supporters that the election is “rigged” against him. “Remember, we are competing in a rigged election,” he told supporters in Wisconsin on Monday.